The Hotel Fiorita is a 3-star family-run hotel located in Bellaria located a couple of minutes walk from the beach. Ideal for families, it has parking for all customers, air conditioning and free bicycles. It admits small animals. The hotel is located in Bellaria and enjoys a quiet and little traffic position, just a couple of minutes walk from the beach (with direct access) and less than 10 minutes walk from the center and the train station. All rooms are equipped with air conditioning, free WI-FI connection, satellite and digital TV, telephone, safe and bathroom with shower and hairdryer. Some rooms have a sea-view balcony. VIOLA: they have the services listed above, with balcony, 1 double bed and 2 single beds. GENZIANA: two-room apartments located on the third floor in different solutions, in addition to the services listed above, offer a balcony, multi-function shower with sauna and hydromassage. COTTAGE IN THE GARDEN: two-room apartments with independent entrances, ideal for those looking for a more peaceful and private stay, equipped with air conditioning and fridge. 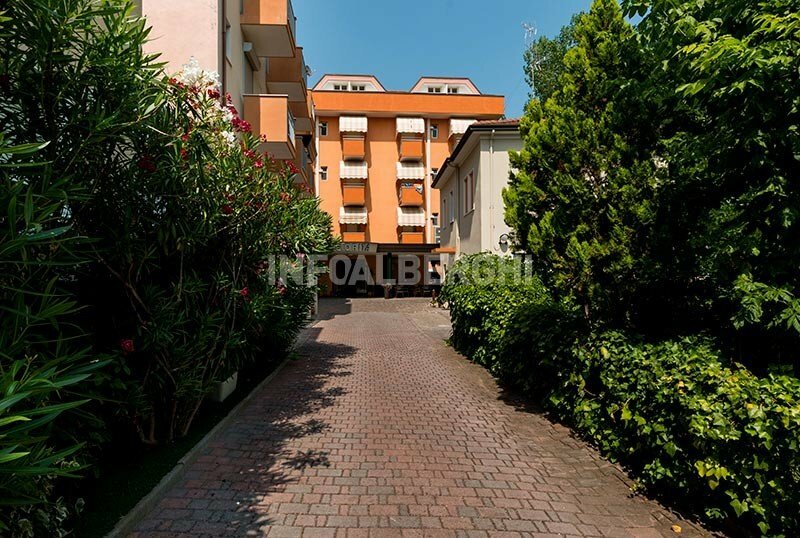 Large garden, terrace with solarium area, free bicycles, reading room, bar, TV room and lift. The staff organizes theme nights. PARKING: covered and uncovered, available for all customers. LUNCH AND DINNER: 3 choice menus with typical specialties of Romagna and national cuisine with daily fish dishes, pasta and homemade desserts. CHANGES: the menu is suitable for vegetarians and on request dishes for celiacs are prepared. In hotel: indoor and outdoor playground area, entertainment service, strollers and pediatrician (at extra cost). At meals: table seats, baby food and bottle warmers. On the beach: entertainment service. The hotel has an agreement with the Bagno Gori beach club n.16, accessible directly from the hotel and equipped with a gym, beach volleyball, beach tennis, five-a-side and bowls courts. There are also table tennis, table football, sun beds, beach umbrella and showers. Hotel price list prices are per day per person. - In case of absence the price of the daily pension is counted in full, on request will be delivered a travel basket in place of missing lunches. - The reservation is valid for the number of people communicated at the time of booking. - The appatamento is delivered after 15:00 on the day of arrival and must be vacated by 10:00 on the day of departure. - Upon arrival, in addition to the balance of the lease, a security deposit of € 100.00 must be left to guarantee any damage caused by the client, which will be returned upon departure after checking the apartment. - Cost of final cleaning, if not carried out by the customer, equal to € 35.00. Special offer for families valid from 27 July to 3 August in Bellaria! In Formula All inclusive, starting from € 395.00 per person for a minimum stay of 7 days. 2 adults + 2 children = 3 units. What are you waiting for? Call now for a quote tailored for you.